Cast : Tom Cruise, Justin Chatwin, Dakota Fanning, Tim Robbins, Miranda Otto, Rick Gonzalez, Yul Vasquez, Lenny Venito, Lisa Ann Walter. Synopsis: When aliens arrive on Earth and begin to obliterate all around them, humanity, and one father in particular, must find it within himself to save his family from certain destruction. Review : Exciting, exhilarating, terrifying cinema experience, perhaps Spielberg’s best since Private Ryan, in terms of it’s emotional grip on the viewer. Dynamite effects and action sequences, coupled with a layered and intense performance by Cruise (who’d have thought?) and this film is a tense, edge-of-your-seat viewing masterpiece. 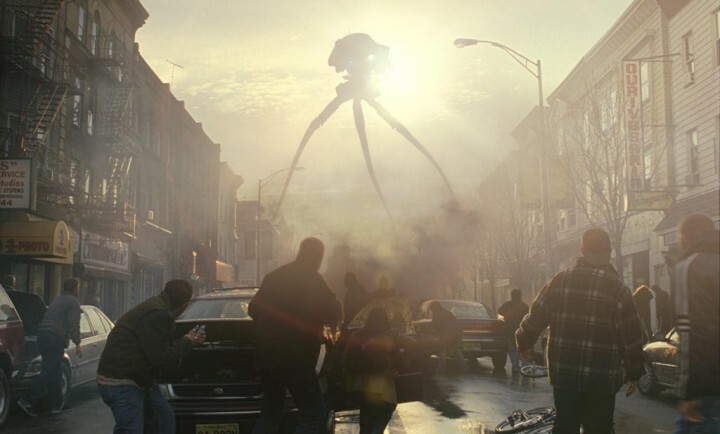 Staggering, devastating, powerful take on the HG Wells classic by modern maestro Steven Spielberg, War Of The Worlds offers a frightening look at potential global catastrophe played out through the eyes of a post 9/11 world, fresh from terrorism and war. It’s present day, and all seems right with the world. 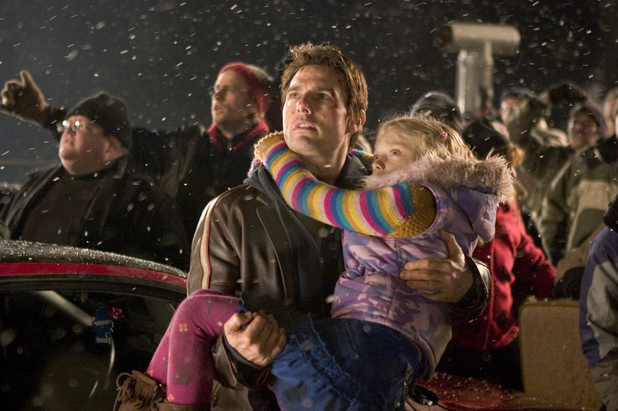 For Ray Ferrier (Tom Cruise), his shift at a container shipping yard has finished, and he’s off home to his son and daughter, who are about to arrive courtesy of Ray’s estranged wife. After ditching his kids and heading to bed for a nap, Ray awakens to find his children missing. Before he can react, however, he see’s a strange, black and grey could nearby, and wouldn’t you know it, strange electrical energy zapping towards ground at regular, pulsating intervals. Yes, the weirdness kicks in pretty quickly, and Ray is confronted with the awful vision of an alien craft emerging from a destroyed street and blasting everything and everyone into dust. The aliens have attacked. When the aliens attack, and boy, do they attack, Cruise is the first to run for the hills, his desperate search for sanctuary overriding his loyalty to even his children, his own flesh and blood. He drags them out of the house, after escaping round 1 with the tripods, and takes off in a stolen car, freeways and suburbs exploding in flames around him, pummeling your senses until you almost want to scream “Enough!!”. The tripods, their destructive vaporizing beams of energy eliminating humanity one street at a time, are impenetrable, they seem to be unable to be defeated. The army, the airforce, all take shots at these massive machines and fail: a raging ball of flame and death are all that remain of the armed forces. Rays son, Robbie (Justin Chatwin) is an annoying chump intent on suicide by wanting to leave his father and go fight the machines, much to his fathers chagrin. Instead of doing the sensible human thing and legging it, he wants to flail headlong into the fray, guns blazing and showing those pesky aliens they can’t take his planet without a fight. Rays daughter, Rachel, played with tear-stained emotion by Dakota Fanning, is a panic stricken ball of fear (rightly so, I would think) and her paranoia and terror are a key factor in keeping Ray alive. After all, he needs to protect his family. Ray, it would seem, lacks any kind of common decency as a man. He’s morally bankrupt, selfish and oafish at times. His family is seen as an unwelcome hindrance to his life, especially his son, who I feel he sees as a disappointment. Robbie, meanwhile, utterly detests his father. 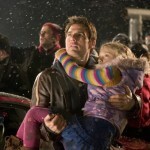 The film progresses along the familiar line of the abrasive father coming to terms with the until now untapped love for his daughter and son, his realization that there is more to life than just bitching about things and skulking about the house. Pity it took world destruction to make him see it, right? Cruise plays Ray straight, his megawatt smile restrained for the majority of the films length. He’s a knob, you see, and the audience is supposed to want to shake him silly until he realizes that he’s not The Man he thinks he is. He’s a wanker. Plain and simple. So why did Spielberg make him so? Would he expect us to empathize with Ray? Feel sorry for this loser, this idiot for not feeling decent human compassion and sorrow for his situation? No, Spielberg challenges us to see a little of ourselves in Ray, in that when things go all pear-shaped, and the crap hits the fan, we all turn into selfish, help-ourselves wankers. In the heat of the moment, we’re more likely to turn and run than stop and save the baby. It was a brave choice by Spielberg to make Ray such a prat, and his son is barely any better, although it’s a kindness that about half way through the film Robbie is killed off. Oh wait, did I ruin that for you? Sorry, but there’s a plot twist coming up later that bug’s the hell out of me, and I need you to know this in order for that twist to make sense. Along the way, fleeing from the tripod attack, Ray and his family encounter the best and worst of humanity. Everybody is fleeing, as you’d expect from a cataclysm like this. Nobody is safe, everyone is frightened, and humans turn to their base instincts to survive. A car, the very one Ray and his family are driving, is seconded by a crazed mob, who see it as a faster means of escape: although, truth be told, there isn’t any escape. The aliens are everywhere, and with humanity scattering across the planet, they look like they’ll win. Humanity has degenerated to beasts, to animalistic instinct, and Ray must protect his family from these crazy, desperate individuals. 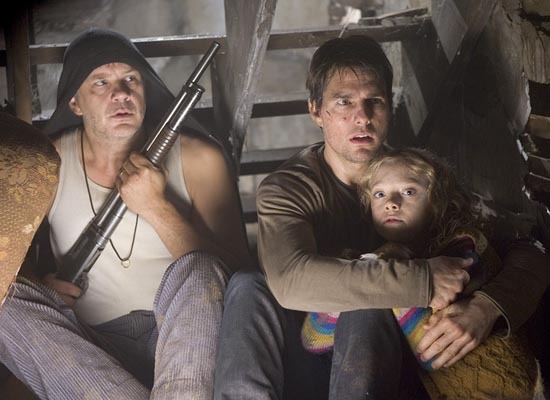 After the destruction of an entire army platoon, and his son as well, Ray escapes a fiery death by hiding inside a farmhouse with his daughter and a fellow escapee, Harlan Ogilvy (Tim Robbins, in fine wide-eyed form) while the destruction rages around them. By remaining silent, they escape the notice of the aliens, who are beginning to spread a red weed across the landscape, sucking the planet dry of all life and substance. Here, the film ceases to be a road/chase film, and becomes an exercise in terror, as the threat of alien intrusion ensures the tension is ratcheted waaaaay up high. A particular moment, when a couple of the slimy alien creatures ventures into the house to check it out, is raw, pure Spielberg. The bravura camera work, the editing and the sound all create such an element of fear and horror that you inadvertently find yourself holding your breath. Snap: a sound, and all hell breaks loose. The decision by Ray to kill or be killed by Ogilvy is a terrifying one for him, his eyes reflecting in all of us the decision we might someday have to make: do we kill to stay safe, or not kill and potentially die. It’s a tricky one, and the resolution offered in the film here is of little comfort to us. Robbins is perfect as the man slowly going crazy, his paranoia such that he escalated his own fate with surprising ease; even if it’s not entirely unwarranted. Resolutions are never easy in films like this. Spielberg has spent a while throughout the film developing Ray and his daughter and son, and by the end of the film we finally have a good handle on who they are, how they should react and behave in a given situation. Like all good Spielberg films, we are taken on an emotional journey, be it good or bad, and the outcome, while never certain, is always going to move us. here, it does as well. Had Robbie remained dead, the story would have had that much more impact at the conclusion: in order for Ray to find himself, he had to lose his son. His emotional and moral journey would have been complete. Instead, his feelings prior to learning that Robbie had survived are erased in a second, the moment Robbie walks out the door of his mothers place in the final frames. 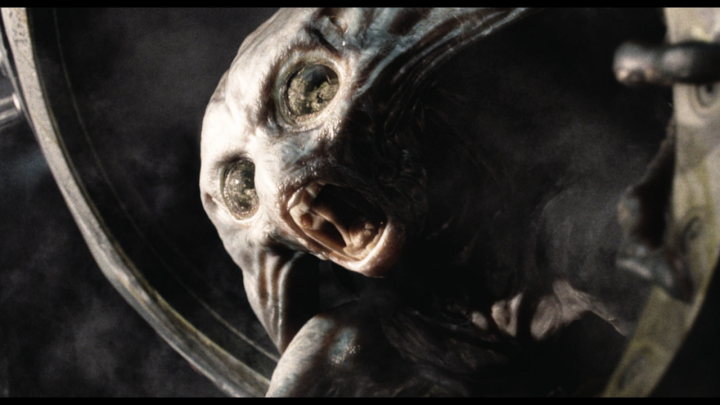 Gone is the sense of loss, the profound sense of despair at losing a child, dented emotionally by the aliens but not defeated: Spielberg seems unable, or unwilling to allow a film to end with such a sense of horror. For me, the sense of loss and resurrection in the films final act is blasted to smithereens by the revival of a thought-dead son. Annoying, and spoils the emotional payoff of the entire film. One of the truly awesome things about this film, and something that separates it from many other CGI-heavy films of our age, is Spielberg’s utter contempt for rapid-fire editing and showy, flashy jump-cuts to hide the effects. Long, lingering shots of the aliens, the tripods, the destruction, hugely expensive CGI shots all blast their way at us and draw us into the story. Why cut for the sake of it, appears to have been the mantra here. This is an easy film to watch, a real treat for the brain, since you’re not having to deal with a slickly edited, jerky, jumpy narrative that is confusing and blurry. Editor Michael Kahn must have been extremely pleased to get some of the footage he had to work with on this film: it’s gorgeous, brilliantly composed and utterly Spielberg-ian. You can see the directors visual flourishes in almost every scene. One has to ask why Spielberg would make a film like this, to resort to analogous events in the real world to put us squarely in the gaping maw of alien destruction. The snowy ash of the disintegrated humans in the initial attack is reminiscent of the Auschwitz holocaust, where human ash floats through the still night air from the chimney-top above. Chilling. The destruction of buildings and people into vapor, analogous to 9/11, the deterioration of humanity’s basic moral structure, similar to wartime and poverty: people turn to animals when they have nothing to lose. It’s effective, but is it justified, film-making? For me, I find this kind of film disturbing, and indeed, it gave me nightmares for a while after seeing it. Something about giant alien tripod feet chasing me through a dark city street, dodging debris as buildings and superstructures collapsed around me, I had an all-pervading sense of compression, as though the very life was being squeezed from me by those aliens simply by their mere existence. When I woke up, I remembered the dream vividly. The film works on you at a primal level. A power of such magnitude, beggaring belief with it’s ferocity, from a source utterly alien to us, is one of our great fears. After all, what would we do if aliens really did come down and invade. It’s a similar scenario to the old classic The Day The Earth Stood Still: it plays on our sense of “holy crap, we’re not alone after all!” terror, finally knowing that we aren’t the most powerful creatures in existence. It’s a hard lesson to learn, but one we must eventually figure out. 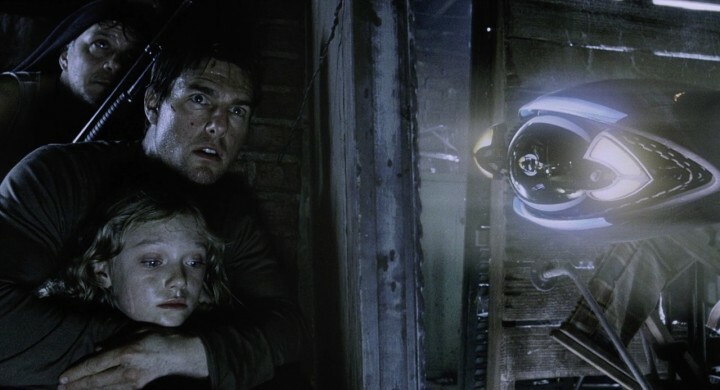 War Of The Worlds is a decisive victory for Spielberg, cinematically ensuring Tom Cruise’s personal doesn’t detract from the final film… it doesn’t, in fact, this is one of the Cruisers best performances, to be honest. Spielberg also shows us why he is one of the most successful filmmakers of all time, his mastery of the medium is superlative and in the case of this film, almost above criticism. Almost, however. You’d be hard pressed to truly “enjoy” this film in the truest sense of the word. War Of The Worlds is an exercise in human terror, touching a nerve within us all , the primal fear and horror we all face on a daily basis in one form or another. Our exposed collective psyche is laid bare here, how do we react when faced with certain oblivion. Makes you think. © 2008 – 2015, Rodney Twelftree. All rights reserved. Haven't seen this since it came out but I remember that scene where they're hiding from the eel-like scout thing having me right on the edge of my seat. I'll probably revisit this one soon. Great review! This is a go-to demo film for me – the sequence with the alien bursting from the ground at the intersection, and the subsequent demolition of that bridge as Cruise and Family high-tail it out of there, are subwoofer cranking, surround sound orgasmic joy.